One of the joys and delights of a true sports car is the manual transmission. In addition to allowing the driver to be in control of the gear-selection process, manual transmissions generally provide superior fuel economy and performance than automatic transmissions. It is essential, however, to know the “proper” way to shift a manual transmission to enjoy these advantages while enhancing driver/passenger comfort. Virtually everyone knows how to upshift a “stick,” but downshifting is an art that few Americans seem to know how to do well. In particular, very few drivers today double-clutch (or “double de-clutch”), which is also known as “matching revs” between the engine and transmission. Most drivers, when downshifting, merely press in the clutch after letting off the throttle, jam the stick in a lower gear, and then let out the clutch. In modern vehicles, this is possible with synchromesh transmissions, but is usually accompanied by a sudden rearward weight transfer, if not any less-than-harmonious engine/transmission noises. To the occupants, especially the passenger, this jerkiness can be annoying, and in spirited driving, this sudden weight transfer can have an adverse effect on handling. Perhaps more importantly, however, is that the life-span of the synchromeshes may be shortened with this practice. The solution, then, is to double-clutch! Let off the throttle, press in the clutch, and shift the “stick” to neutral. 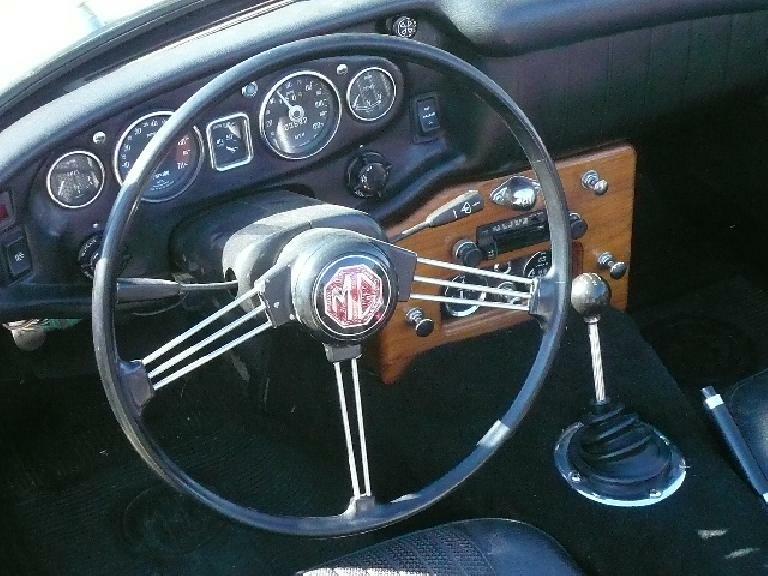 Bump the throttle to make the engine “blip.” Sometimes in my MG I’ll press in the accelerator all the way to the floor for a fraction of a second. As the engine speed decreases to match the transmission speed, throw the stick into the next lower gear. Since you actively “matched the revs,” it should fall right in! Let out the clutch. The downshift should have been as smooth as butter! Another advanced technique is heel-toe downshifting. Heel toe downshifting is a variation of double clutching, but is performed while the car needs to slow down quickly (as in the approach of a sharp corner). More precisely, heel-toe downshifting is double clutching, except that you are braking at the same time! The name comes from braking with one’s toes while blipping the throttle with one’s heel of the same (right) foot. Admittedly, this technique takes a lot of coordination and practice! Excellent article… thanks for the read! Awesome article!! Gonna try to incorporate this into my current driving techniques and hopefully save wear-n-tear and money in the long run. Nice article! Thanks for the advice. Thanks for the info. I currently drive an 06 Acura RSX-S and am trying to pursue a racing career as soon as I get out of college. I will practice as much as possible. Cool! I figured this out myself after I let out the clutch in the “normal” way, and the back end slipped out and I ended up sideways in the road at only 15km/h (I’m an aussie so excuse the metric system). I’m no idiot at driving, but it catches even the best drivers. So from now on, I always double clutch. Besides, it sounds coolio! Thanks for the memories! The last time I double-clutched one of our good old Army jeeps was in the early 1950s. Didn’t know people still know how to, most of them can’t even shift grears. I just got my manual transmission on my ’92 Honda hatch and I was desperate to read about the double clutching. Thanks for this article. I just watched a street racing film called “Fast and Furious.” They mentioned about double clutching so I wondered what it was. But with this clear guide, I will use it in my day-to-day driving, hoping to save my engine and transmission. I’m not going to be a professional racer but it sounds good to be able to do this skillful technique. I recently had a chance to take my boss’ ’62 MGB for a few laps around SPA. I really struggled with the 2nd gear changes approaching the hairpin, and the Z bends. I tried the double de clutch, but forgot about blipping the throttle, creating plenty of grating of gears – hence me reading up on it. I will practice before we return this June. It is an awesome experience, although going from the safety of a modern car to a little old MG is a scary experience, but it won’t put me off. Thanks for your explanation. Adam, you’re not completely correct. Most racing cars don’t have synchronizers, it adds speed/HP. The cars used in “Fast and Furious” most likely didn’t have synchronizers, and in order to match speeds of the engine and transmission you do need to double clutch. Hey, cheers for the article. I didn’t know how to do the double declutch and I’d never even heard of the heel toe braking. After a day on the track with my dad’s car, I’m getting the double clutch. Sweet!! Interesting, I started to use the heel and toe down shifting method a few months ago and I’m getting pretty good at it. The only thing is that I just realized that what seems to be the “real” technique is to use your heel on the throttle and your toes on the brake pedal, but I use my toe for the throttle and heel on the brake pedal….Am I the only one to do that?!?! Double clutching become alot easier once you are in a position you have too. I drive a 03 tiburon GT and the master and slave cylinder went out and it would not go from gear to gear with one press of the clutch. The only way to get it into gear was to double clutch. Once i got the transmission fixed i found to have a quicker quarter mile and more tourge around corners. I would incourage anyone with a manual trans. to double clutch. but u could do abit more explaining on the Heel-Toe Downshifting. Even though I do not have a car I enjoyed reading about doulble clutching. A family friend drove a clutch. She drove a front-wheel drive Chevy Nova ; she has passed . I wondered what I was doing all this time, I never knew that double clutching was the term for that, Ive been doing it since ive started driving, it just made sense to rev the engine to match the spend of car when slowing down but my question is whats the term used for poping the gear stick from 1st gear to 2nd without using the clutch and does every car have its own limit of revs you can take it up to without grinding the gears when changing, thanks. Yup, double clutching rocks. Besides, people sometimes use it for drifting so the car at high RPMs, with the necessary counter-steering, can perform a drift. Well, I’m 14 and I love this stuff. Thanks, man. This is a nice article. I really apreciate the info given here. Iv’e allways driven stick shifts and used to think I was the best at it. (Obviosly I was way wrong.) Recently I put in an app to drive buses with manual transmissions. I knew double clutching was necesary but thanks to you now I kind of understand it and maybe I’ll be able to pass my tests. Thank’s a bunch! I have already broken the dogbox transmission not double clutching. Did not know how to do it till now, but too late. Once the rebuild is done this procedure of shifting will be applied. Hey this is a great article. I could not believe it when the pic was a mgb because I own a 74 mgb and am in the process of restoring it. Odd little cars but really fun to drive. Hey thanks Brandon. Good luck restoring your ’74 MGB. I miss my ’69 a little bit. I sold it in ’07 after owning it for 12 years, but still have lots of memories of the car.